A Dead Cop. A City Afraid. A Killer on the Loose. At a squalid flat near the Cardiff docks, an early morning police raid goes catastrophically wrong when the police aren't the only unexpected guests. A plain clothes officer is shot dead at point blank range, the original suspect is left in a coma. The killer, identity unknown, slips away. Mike Thomas was born in Wales in 1971. For more than two decades he served in the police, working some of Cardiff's busiest neighbourhoods. He left the force in 2015 to write full time. 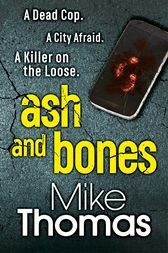 Mike has previously had two novels published and was longlisted for the Wales Book of the Year and was on the list of Waterstones 'New Voices'. His second novel, Ugly Bus, is currently in development for a six part series with the BBC. He lives in the wilds of Portugal with his wife, children and a senile dog who enjoys eating furniture.